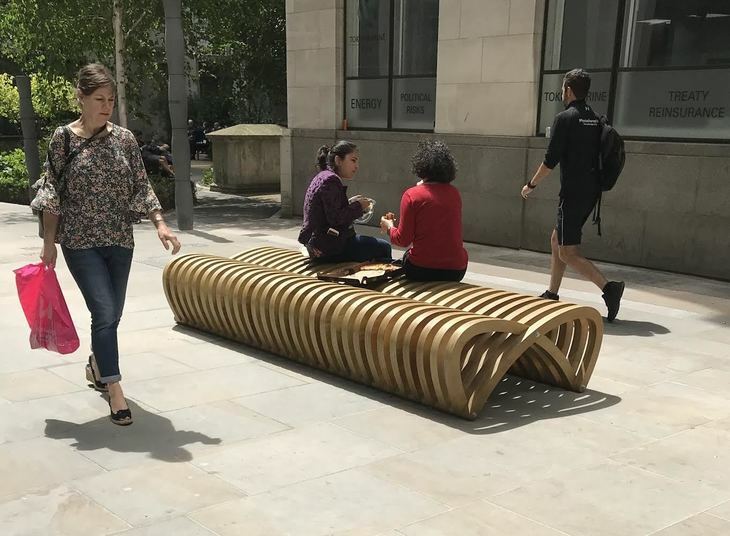 How Many Of These Stylish Benches Have You Spotted? 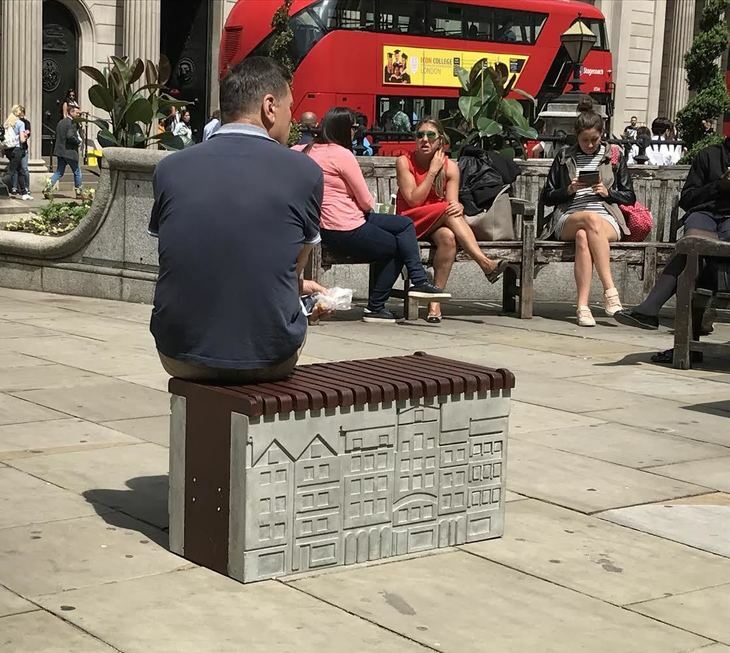 M@ How Many Of These Stylish Benches Have You Spotted? Oh dear. 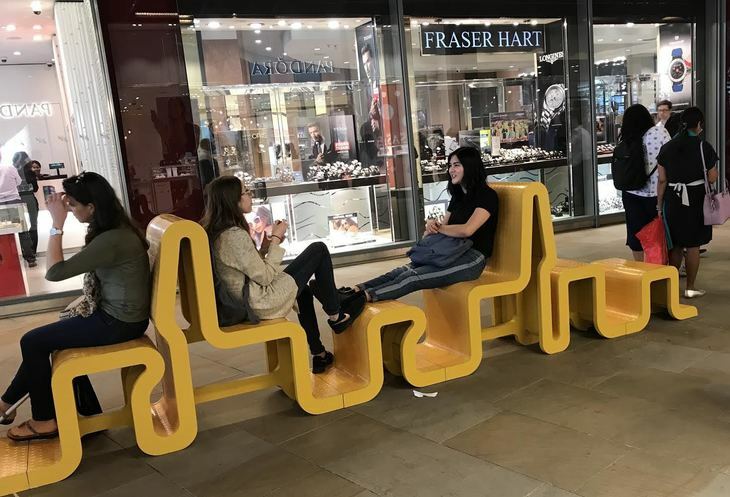 This rather lovely bench from Studio Yu and Tomos Design seems to attract very little attention. Nobody took a seat in the five minutes or so in which we loitered, trying not to look shifty. Perhaps it looks a bit too much like a planter... or a Formula 1 barrier. The hexagonal design is in fact inspired by the Giant's Causeway in Northern Ireland, and can be reconfigured into different formations to fit different spaces. 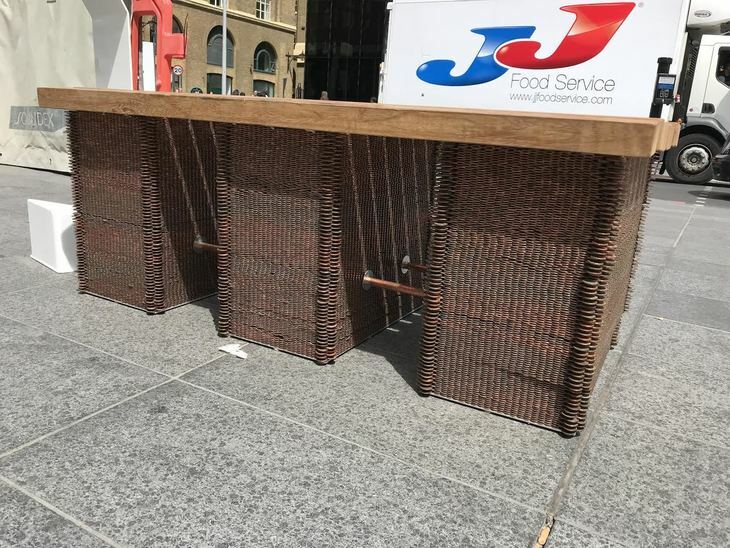 A bench made from pennies? Well, there's not much else you can do with them these days. Nicholas Kirk Architects stacked 45,000 of the fungible discs to shape the Money Box Bench. This one also attracted zero custom during our observation — not helped by the preponderance of construction work going on around it. 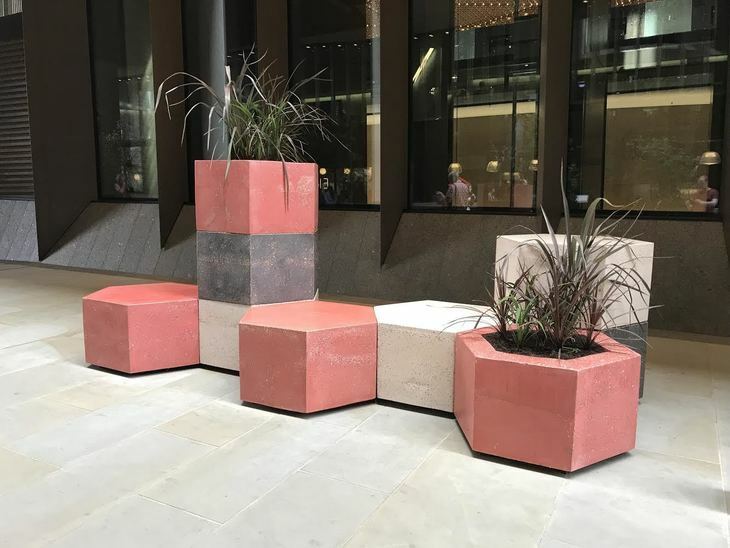 Find it outside the new entrance to the mainline station on Tooley Street. Sadly, the clear winner in terms of invention was also among the most neglected on our visit. This sepulchral bench stands within Jubilee Garden just off Houndsditch. 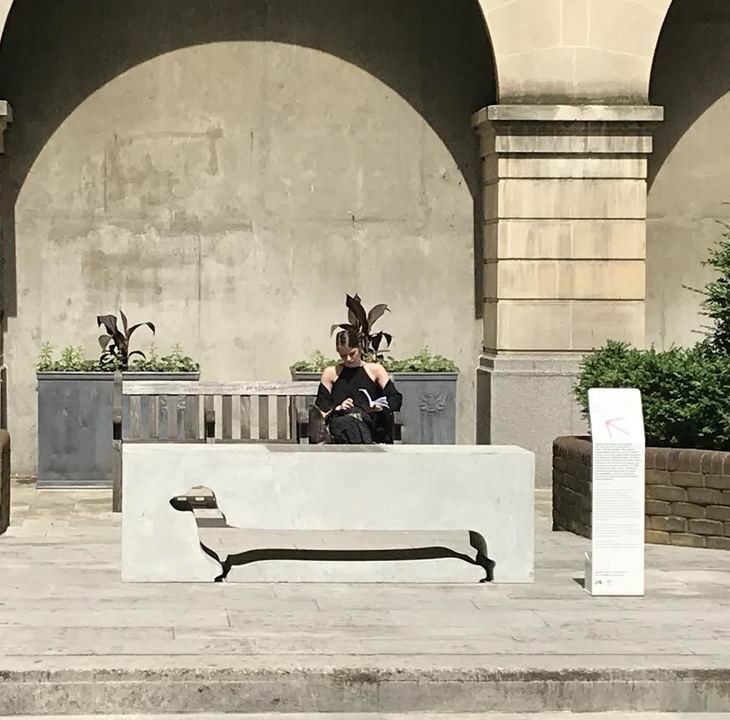 It contains a cut-away impression of a daschund — partly as a pun on the nearby street name, and partly as a memorial to a dead dog belonging to architectural assistant Patrick McEvoy. A plaque on top reads "Here lies Geoffrey Barkington of Houndsditch... aged 98 in dog years. May he rest in peace." The whimsical tombplay seems to be putting off the punters. All the other benches in the area were taken, but Mr Barkington's final resting place remained vacant. 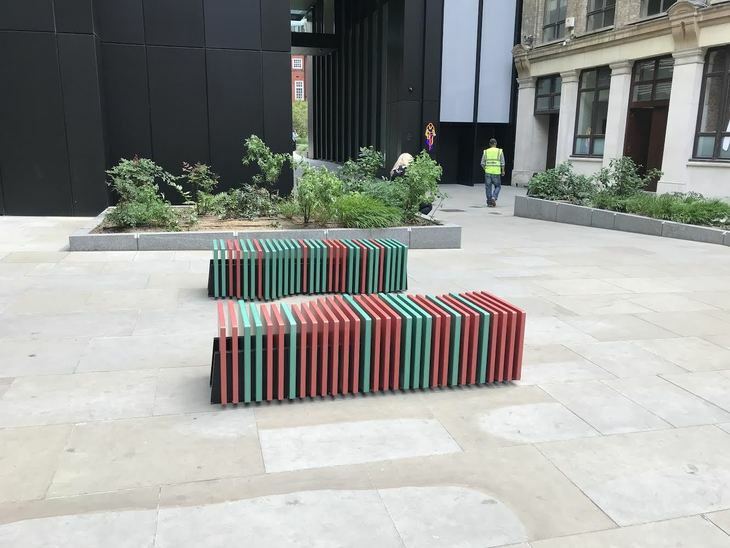 Dubbed 'Benchmark', this duo of seats is inspired by the ups and downs of the London Stock Exchange (though, curiously, it's one of the furthest benches from that institution). Despite our photo showing it empty, the installation by Elena Boni and Studioort did get a couple of brief visits during our linger, including the construction worker shown in the photo. This understated bench is gently curved for optimum buttock support. It also strikes us as a splendid resource for rebellious skateboarders — not that they'd last long under the watchful gaze of City CCTV cameras. 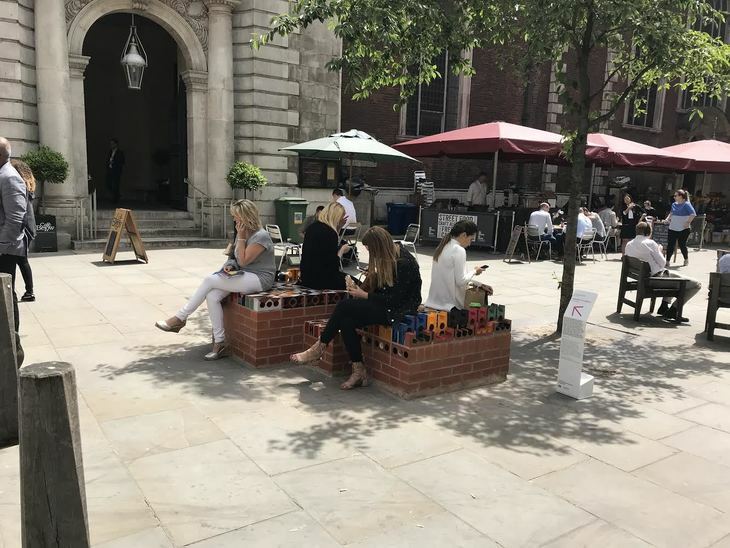 The design by Mills Turner provides more seating area than many of the other benches, but only attracted a couple of clients during peak lunchtime. Again, though, its position next to a building site might explain the low uptake. The busy island in front of the Royal Exchange always attracts bench-seekers, despite the traffic fumes. You could place a dead camel here and somebody would probably sit on it. No surprise, then, that Mariya Lapteva's City Ghosts bench was permanently occupied during our entire 10-minute vigil. What looks from afar like a removals crate is actually rather clever. The grey base shows the facades of local buildings long since demolished. We feared that this over-polished shopping complex might offer a similar anonymity to the bench in Bloomberg Arcade, but no. Here, McCloy + Muchemwa's 'A Bench for Everyone' lived up to its name, attracting a steady supply of bum parkers. 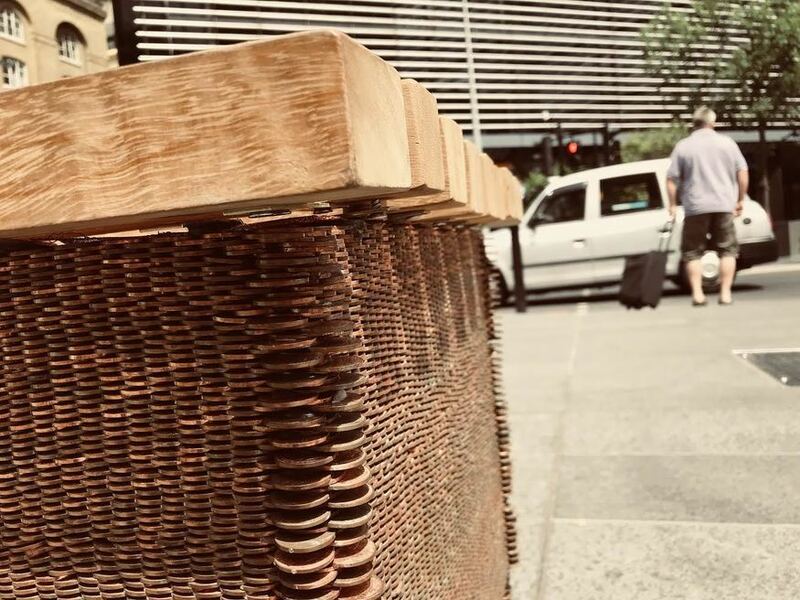 Many made full use of its saffron undulations — a rare bench where you're encouraged to put your feet up. Bravo to the architects. 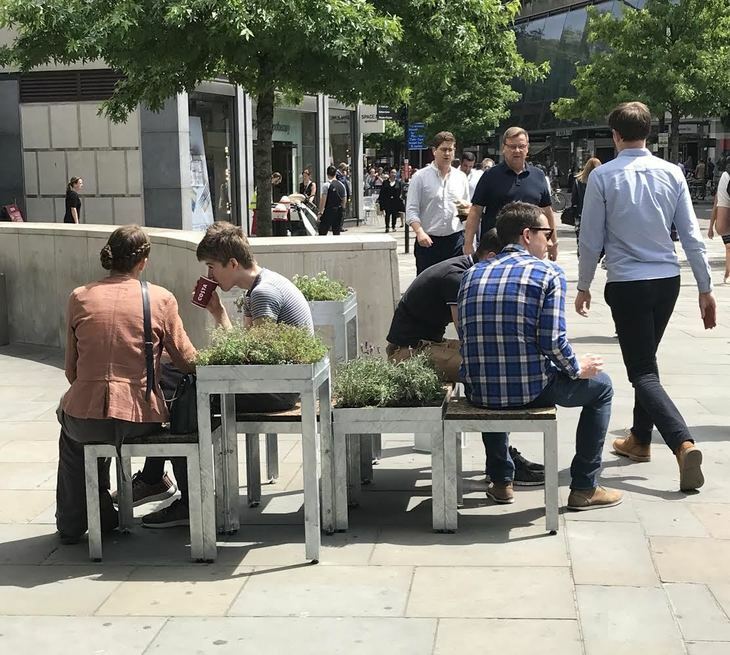 Perhaps the least striking aesthetically, The Garden Bench from Eleanor Dodman Architects proved irresistible to the lunchtime loungers of Cheapside. Every seat was taken during our observation. Perhaps they were drawn by the smell of the planting, which includes lavender, camomile and thyme. And the winner... in terms of popularity during our totally unscientific whistle-stop tour... is this dainty number outside the church of St Mary-le-Bow. Architect Maria Gasparian has built a platform of bricks and topped it with colourful clothes pegs. Not sure it really does much for us, but the stylish seating was full to capacity on both the occasions we set up watch.